Brexit, Catalonia and the rise of the AfD in Germany are an anticipation of even greater upheavals to come. Analysing European perspectives for the next period, we are carrying here extracts from a draft statement for the forthcoming meeting of the International Executive of the Committee for a Workers’ International (CWI), written in early November by TONY SAUNOIS. The dramatic events that have erupted in Catalonia and the Spanish state are a reflection of the underlying social and political crisis gripping many European countries. While the propaganda of the ruling class was that they had re-stabilised and resolved the political and social crisis which unfolded in Greece, first Brexit and now Catalonia reveal the underlying social and political situation which exists in many EU countries. There has not been a generalised upsurge in the class struggle in Europe, yet this does not mean that the capitalist class faces a stable situation. Political shocks, crises and upheavals continue to confront the capitalist classes across Europe. Some capitalist commentators confidently look towards a return to substantial economic growth based on rising levels of the gross domestic product within the eurozone in the last quarters. However, the growth that has taken place – 2.1% this year – has at best been sluggish and is extremely uneven. It has not been accompanied by a rise in living standards but by continued austerity. Greece, Spain, Portugal and Italy remain gripped by mass unemployment, in particular among the youth. Across the eurozone the real level of unemployment – not just those officially registered – including hidden unemployment, stands at 18%! Precarious jobs and minimal wages, especially for young people, are increasingly the norm throughout the EU. The slave labour scheme in Italy, which compels students to work for no pay, is an indication of the scale of the attacks which have taken place. At the same time, the underlying problem of the debt crisis has not been resolved. Apart from a re-eruption of the Greek crisis, which is possible, there is the possibility of a crisis unfolding in Italy should it be unable to continue to service its public sector debt which amounts to 130% of GDP. The Scandinavian and Nordic countries emerged relatively unscathed from the 2007/08 crisis. However, the build-up of debt points towards them being more dramatically affected in a future crisis which will have important repercussions in the class struggle. There are also major issues developing in the European economy that will arise from the introduction of robotics and other changes in production. In Germany there is a discussion about the need to restructure the auto industry. The tensions which will arise between the trade blocs was recently shown in the conflict between the US and Canada over Bombardier which then spilled over into Britain. In addition to Brexit there have been increased clashes within the EU. In the east there are heightened tensions with Poland and Hungary. Poland is preparing to lodge a claim for war reparations from Germany. Donald Tusk, the former Polish prime minister, went so far as to declare that "the EU did not need Poland and vice versa". This prompted some commentators to pose the question of a ‘Polexit’ triggering a new crisis. There is also the continued increase in tensions between Vladimir Putin’s regime in Russia and the EU. Putin has suffered some electoral setbacks in recent local elections. However, his regime still retains a significant social base of support. The opposition is mainly based on the petite bourgeoisie and has not involved a movement of the working class, at this stage. Emmanuel Macron’s attempt to push for greater integration of the eurozone economies with an agreed budget has been partly checked as Angela Merkel is compelled to draw back, looking over her shoulder at the far-right. Further attempts to increase eurozone integration are possible. However, how far these go is not at all certain and they go against the grain of the centrifugal features currently at work. This will lead to further conflicts within the EU and the eurozone. Sections of the German ruling class are concerned that they would have to foot the bill for a more integrated eurozone, something they are not prepared to do. 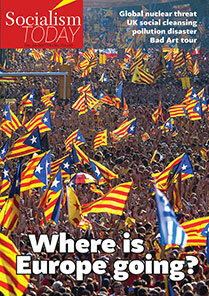 The upheavals in Catalonia have included elements of revolution and counter-revolution. They have also revealed the importance of the national question for the working class and revolutionary Marxists, and exposed the crisis of leadership which exists. Such dramatic events are a test for all left and socialist organisations, especially for revolutionary Marxists. The comrades of Izquierda Revolucionaria and the CWI have correctly defended the right of the Catalan people to decide their future. We demanded a socialist republic of Catalonia, fighting together with the working people of the rest of the Spanish state to oppose the ruling class and Partido Popular (PP) in a common struggle to establish a voluntary, democratic socialist confederation of all the peoples of the Spanish state. This is in marked distinction to the treacherous role played by PSOE. The leadership of Izquierda Unida (IU) and the Communist Party has been lamentable as they have abandoned the defence of the right of self-determination for the Catalan people. This has more recently been echoed by Pablo Iglesias who has removed the leadership of Podemos in Catalonia and threatened to expel the one member of the Podemos-linked parliamentary group in Catalonia who voted in favour of declaring independence. The nine other Podemos deputies all voted against. This has opened up a crisis inside Podemos. At the same time, the left-nationalist CUP has failed to fight for an independent political programme and role for the working class and has wrongly propped up the bourgeois nationalist PDeCat government of Carles Puigdemont. In varying degrees, these mistakes by the Catalan left and the left in the rest of the Spanish state have been echoed by others internationally. At the same time, the pro-independence SNP in Scotland, along with Irish prime minister Leo Varadkar, have not been prepared to support Catalonia and to oppose the stance of either the EU or PP government. The vicious reaction of the PP government and its determination to crush the independence movement has alarmed sections of the ruling classes throughout Europe who fear that the conflict could spiral out of control and open a major crisis throughout the EU. However, this did not prevent the EU, especially the ‘three Ms’ – Macron, Merkel and May – from backing Mariano Rajoy in declaring the referendum illegal. The brutal response of Rajoy reflects in part the composition of the state machine and the PP in the Spanish state. There is a powerful Francoist legacy and tradition which was never purged following the transition in 1978. This includes extremely repressive, bonapartist elements. This is combined by a fear of the consequences of Catalan independence. Catalonia accounts for more than 20% of Spanish GDP and exports. Moreover, if Catalonia were to separate then the Basque country could follow. Puigdemont and PDeCat have demonstrated their fear of mobilising the masses in a real struggle against the PP and for independence. They have demonstrated the incapacity of these bourgeois nationalist politicians to lead an effective fight. Puigdemont and five ministers fled to Belgium, ‘home’ to the EU which opposed their declaration of independence and backed the PP government. Puigdemont then appealed to the same EU to intervene and support the independence movement! Above all, the Catalan bourgeois politicians fear the prospect of an independent movement of the working class which would be necessary to defeat the repression being served up by the PP. The repression and arrest of some of the Catalan government will, however, boost their standing for a period. The Spanish state has lost all legitimacy in the eyes of millions of Catalans especially the youth. This will have serious consequences for the ruling class in the coming period. The national question is of vital importance for the workers’ movement. Marxists defend the right of self-determination and the unity of all sections of the working class. While not capitulating to bourgeois nationalism, it is important to recognise that within national independence movements are often contained an ‘immature Bolshevism’. Each national question is very concrete and it is necessary to analyse each specific situation in determining our exact demands and slogans. As we have seen in Scotland, support for independence can wax and wane. We need to take this into account in the demands we advocate at each stage. A mistake on the national question can have devastating consequences, as has been seen historically. Jeremy Corbyn’s wrong approach on this issue in Scotland was a major factor preventing Labour making important gains there, and which ultimately resulted in Theresa May being able to form a government at the last election in Britain. This was despite the fading illusions in the SNP as it has carried through cuts in Scotland bringing it into collision with sections of the working class. The repressive response of the PP government undoubtedly increased support for independence in Catalonia although it is not certain a majority would support it at this stage. However, in both Scotland and Catalonia it was correct for us to side with the most combative youth and layers of workers who support independence, even when this was a minority – as in Scotland in the 2014 referendum. They represented the most combative layer and broadly indicate the line of march, with ebbs and flows along the way. In Catalonia it is important to win the mass of the working class to support independence. This can only be done by explaining a clear opposition to austerity and the need for a socialist republic of Catalonia. It is necessary to explain that an independent socialist Catalonia would enshrine the democratic and cultural rights of all. This is also important to answer the propaganda of the right wing in the rest of the Spanish state which is attempting to split the people in Catalonia – and to assuage the fears of those opposed to independence in Catalonia – especially those who migrated there from the rest of the Spanish state. The events in Catalonia and the Spanish state are likely to evolve in the short term with many contradictions and complications arising mainly due to the lamentable role of the left – IU and Podemos, and the failure of the CUP to adopt a position independent from Puigdemont. The right wing around the PP and Ciudadanos has launched a ferocious Spanish nationalist campaign which the bigger left organisations in the Spanish state and Catalonia are not countering. It remains uncertain how these events will develop but they signify a turning point in the Spanish state with repercussions for the whole of the EU. This is unfolding alongside the EU’s other major crisis triggered by Brexit. May and her government have managed to stumble on from crisis to crisis since her election ‘victory’ – where the winners lost and the losers won! The crisis gripping the Conservative Party is historic. It has been split into bitter factions over Brexit. A split similar to that over the Corn Laws (free trade) in the 19th century is a strong possibility. This was one of the oldest and most successful parties of the ruling classes anywhere in Europe or possibly globally. At one stage it had a large social base – up to three million members – including among sections of the skilled working class. This has now been reduced to a rump, with a claimed membership of approximately 100,000 – with an average age of 71! May (or Maybot, as she is known) has little or no authority and remains prime minister on sufferance. The two factors allowing her to stagger on are fear of an electoral slaughter of the Tories and the victory of Corbyn, and the absence of a serious alternative Tory party candidate to replace her. This is a reflection of the long-term decline of British imperialism and sums up its parlous state. Corbyn’s ‘victory’ at the last election has temporarily served to demoralise the right-wing Blairistas in the Parliamentary Labour Party. However, they still have control over the party machine and the overwhelming majority on city councils. In the local councils the Blaristas continue to carry out cuts and austerity measures which Corbyn refuses to publicly attack in order to maintain ‘party unity’. The Blairistas nationally are waiting as a fifth column to sabotage and undermine a Corbyn-led government should he win the next election. The party remains two parties in one and its character is unresolved, as we have explained previously. The majority of the forces involved in Momentum and the Labour Party have many of the features and characteristics of the new left parties which have emerged in other European countries. While Podemos has won the support of young people and important layers of workers, especially younger sections of the working class, it has also included big layers of the radicalised petit-bourgeois youth. The Bloco de Esquerda (Left Bloc) in Portugal lacks a consolidated base among the industrial working class. Its membership is largely among young ‘precariat’ workers and petit-bourgeois youth. Momentum in the Labour Party in Britain is largely composed of petit-bourgeois layers. This does not detract from the importance of these developments. In France, for example, the existence of France Insoumise around Jean-Luc Mélenchon is an important factor in the explosive situation unfolding there. However, they are not the classic mass workers’ parties that have existed historically. They are not yet comparable even to the PRC in Italy at its peak which had a much stronger base among the metal workers and other layers of the working class for a while. The mixed class composition of these parties is reflected in the programme and ideas they defend which are not yet of a classic reformist or left reformist character, with little or no reference to socialism. Even Corbyn, with the most ‘left’ posture at this stage, does not generally raise the question of socialism. One of the tasks of the CWI is to explain the need to oppose capitalism as a system and raise the idea of socialism as an alternative. From a historical perspective, Corbyn’s programme is to the right of left reformists like Tony Benn in the 1970s/80s. It is a measure of how far things have swung to the right and how political consciousness was thrown back that this classic moderate social democratic programme seems so radical to the new generation. In reality, the ruling classes do not fear the programme of these new left parties. What they fear is the massive pressure they would come under from the masses to adopt more radical measures. This is not a static process and more radical left-reformist or even centrist programmes and leaders will develop at a certain stage. Leaps forward in this process can take place under the impact of a renewed capitalist crisis combined with the experience of the masses in struggle. The crisis of capitalism means that they are reformists without reforms. This does not mean that the ruling class will make no concessions when confronted with a powerful revolutionary movement of the working class that threatens their existence. However, the era of lasting reforms under capitalism has long passed. This is reflected in the timid and limited nature of the programme defended by these modern day ‘reformists’ at this stage. One of the consequences of the economic crisis of 2007/08 was a devastating assault on the middle class in many countries. This has very dangerous implications for the ruling class in undermining its social base. A significant section of these former petit-bourgeois layers have been radicalised to the left which is a positive development. Sections, like the junior doctors in Britain, have entered into important struggles adopting the methods of more traditional sectors of the working class. However, the inexperience and semi-petit-bourgeois character of this layer is also reflected in the makeup of big sections of these ‘new left’ parties and organisations. The attacks on the middle class have also been accompanied by other important developments. There has been a strengthening of authoritarian methods by the capitalist state apparatus. This has been reflected by the degree of repression used in Catalonia, Germany, Britain and other countries against demonstrations and protests. At the same time, in some countries like Britain, the part-privatisation of the police and cut-backs have led to widespread discontent, even a certain left political radicalisation among sections. This was reflected in opposition to the Tories from a section of the police in the British election campaign. The threat of a de facto strike of the police in Ireland was further evidence of this. In Ireland, our comrades have taken up the cause of the appalling pay levels for rank-and-file soldiers. This has resulted in us winning widespread support, including receiving letters from troops. These developments within the state machine in the medium term are extremely dangerous for the ruling classes of Europe and will give the workers’ movement the opportunity to at least neutralise parts of it. The programmatic weakness of the new left parties partially reflects the consequences of the collapse of the former Stalinist regimes and the throwing back of political consciousness. In addition, the fact that the working class has not yet moved decisively to take hold of these parties and shape them as a political instrument of class struggle. This was an important aspect of the Greek crisis. While workers had voted for Syriza they had not joined it and fought within it. These features point to these organisations being extremely unstable with an uncertain future, especially when tested in great historic events such as Greece, Brexit and now Catalonia. The collapse of the PRC in Italy, which had a more solid active layer of industrial workers, is a warning of the limitations of the new parties. The failure of the PRC – and its eventual collapse – is one of the main factors leading to the difficult and complicated situation which exists in Italy. Recent experience – in Momentum where our comrades have been excluded, the Left Bloc with a renewed witch-hunt against our comrades, the actions of Iglesias in Catalonia – has shown that the leadership of these parties can resort to bureaucratic methods when faced with opposition from the left, especially from Marxists. The failure of the new left parties to offer a strong alternative to the pro-capitalist parties has in some countries allowed the far-right to make significant gains and capitalise on the concerns among layers of workers and the middle class about immigration. The unexpectedly larger gains made by the AfD (Alternative for Germany) in the recent elections reflected this. Maybot in Britain was not the only victor in an election to emerge substantially weakened. This also applies to Merkel. The historic demise of the Conservative Party in Britain is being echoed in other countries. The boss of the giant Siemens corporation described the elections in Germany as "a defeat of the elites". Twenty percent of AfD’s support came from people who had not voted previously. However, this will not stop any new government, whatever its eventual composition, from pursuing further ‘liberalisation’ – additional attacks on the working class and youth. Meanwhile, the ‘social democrat’ SPD saw its vote fall to its lowest percentage share since the early 1930s. That was the price of joining Merkel’s coalition and the role of the party in initiating the attacks on workers especially under Gerhard Schröder. The decline of the SPD’s electoral support is an important feature of this period especially among the youth. It has been reflected elsewhere: the electoral slaughter of the French PS, which lost 90% of its seats in parliament; the decline of PSOE, which has lost half of its vote since the crisis in 2007/08; the prospect of the Irish Labour Party losing all of its seats at the next election; the decline of the PS/SP in Belgium; the collapse in support for Pasok in Greece. Even in Austria, while the SPÖ held onto its overall vote share, it only received 17% of votes from those aged under 29, and from 19% of manual workers – an extremely significant collapse. Sections of the new left leadership are attempting to revive ‘social democracy’ from the ashes of its decline. Yet they are attempting this in an era of capitalist decline and decay when there is no room for the reforms conceded for a protracted period in the past. They are reformists without lasting reforms. They see their programme as a means of ‘reforming capitalism’ to end its neoliberal phase and introduce a more humane form of the market. Left advisers like Paul Mason in Britain make this explicitly clear. This will lead the new left leadership to rapidly betray the aspirations of the masses when or if they come to power and face the constraints and crisis of capitalism. This was graphically shown in Greece with the betrayal of Alexis Tsipras. This has resulted in him being praised by Donald Trump following his recent visit to the US and the announcement that the Greek government is buying US fighter jets! The hopes in the German SPD that it could recover under the leadership of Martin Schultz, who would ‘do a Corbyn’, slumped as he backtracked on his hints at a more radical turn to the left. In Spain, Pedro Sánchez and the movement which developed around him in PSOE crashed against the wall of the mass movement in Catalonia. The possible radicalisation and split in PSOE seems to have evaporated. The decline of social democracy is not uniform of course and there are exceptions. The Labour Party in Britain has seen a large increase in support and membership, for the reasons explained around Corbyn. In Portugal, the PS remains relatively popular. It is propped up in power by the Left Bloc and the CP and, while continuing with cuts, it has carried them out more selectively. Coupled with the idea of a shallow, ephemeral economic upturn, there is a certain sense that at least ‘we have not been crushed like the Greeks’. This mood can rapidly change especially with the onset of a renewed economic crisis or more cuts being made by the government. The CWI has recognised the threat of the growth of the far-right in some countries. Often this has been achieved on the basis of right-wing populist ideas, sometimes – as in the case of France – demagogically stealing from the traditional policies of the socialist left to win votes. In Germany, the AfD played down its most ardent neoliberal policies. Although the AfD is not yet a consolidated political force it may emerge to be so as the Vlaams Belang in Belgium or the Front National in France. However, such parties are limited in how far they can go. They can rapidly go into crisis when they face obstacles or set-backs. This has been seen in the FN following the recent presidential election. Nonetheless, in the absence of powerful mass workers’ parties the existence of such parties is now established as a permanent or semi-permanent feature in Europe. This is illustrated by the FPÖ in Austria which will need to be challenged by new mass parties of the working class. The fact that the FPÖ won the support of 59% of manual workers shows the alienation that exists and the concerns of this layer particularly following the refugee crisis. The forces of the CWI have a crucial role to play in intervening to defend the rights of immigrants, opposing racism and fighting for workers’ unity and in addressing the fears and concerns of many workers. The threat from the far-right will also produce a backlash, especially from the youth, as has been seen in Germany. The tremendous demonstration of 20,000 in Gothenburg against the fascist NMR, in which the Swedish CWI section, Rattvisepartiet Socialisterna, played a decisive role, was an illustration of this. Sweden has remained relatively unscathed by the economic crisis of 2007-08. However, the constant jostling and realigning of parties, and an increase in quite determined social struggles, are indications of the convulsions to come. The coming to power of the right-wing, populist nationalist parties in some countries of central and eastern Europe is a warning of the threat which these forces can pose. For example, the extreme nationalistic rhetoric and bonapartist measures adopted by the Law and Justice government in Poland. Yet its attacks on democratic rights and attempts to shackle the judiciary have provoked a backlash. At the same time, it has introduced some social reforms on child benefit, an hourly minimum wage and a pledge to reduce the retirement age. This has enabled it to maintain a level of support among some workers. Yet the government’s policies have provoked protests and struggles. Significantly, the initial protests against the proposals to tighten government control of the judiciary were initiated by the small left forces around Razem (Together Party) and the trade union federation, OPZZ. The shocks which have erupted in the past period – Brexit, Catalonia and the growth of the AfD in Germany – are an anticipation of even greater upheavals which will erupt in Europe in the coming period. These will include the elements of revolution and counter-revolution as we have already seen. Through the application of flexible and bold tactics and initiatives, the CWI in Europe can make significant steps forward. It can assist workers and young people entering political and industrial struggles to draw the conclusions to take on the tasks and programme necessary to defeat capitalism.